Many of our community’s leaders are among those taking the Food Stamp Challenge (see page 5 of this week’s issue). Among them are Rabbi Nancy Kasten, Rabbi Heidi Coretz, JCRC Director Marlene Gorin, and Andrea Weinstein. It’s not too late to join the project as well. You can read more about Dallasites who are participating at http://www.facebook.com/DallasFoodStampChallenge. It was with great pleasure that I attended a celebration last month for Sam Raden’s 100th birthday. You can read more about Sam’s celebration on page 14 of this week’s issue. One thing that we didn’t mention there, was how blessed we are to be among the Raden’s friends. The Radens met the Wisches when my mom, Rene, was in the hospital with the birth of her first child, my sister Linda, and Bernice was recovering from the birth of her youngest, Buddy. My understanding is that Bernice was toward the end of her stay, and mom had just begun hers. They formed a quick bond in those 24 hours, learning among other things that they shared a similar name — mom’s maiden name was Radin, they shared the same wedding anniversary, March 26 — and alas, they both happened to be Jewish. I’m not sure if that’s what they did back in those days at Harris Hospital in Fort Worth — put the Jewish patients together — but for whatever reason a life-long, committed friendship was born along with those two babies. When the TJP was in its infancy, I’m told that Sam and Bernice spent many hours helping to roll and bundle papers for the mail. This took place in my parents’ spacious efficiency apartment across from the old Beth El Congregation. Shortly thereafter, the Radens moved to Dallas where they’ve lived now for over 60 years and have remained cherished family friends. Mazel tov to Sam and all the Radens on this incredible milestone. My first experience with cholent was as a youngster many years ago at an Ahavath Sholom Shabbaton. Cholent is a traditional Jewish stew that is brought to a boil before Shabbat and then allowed to slowly cook overnight, thus conforming to the prohibition of cooking on Shabbat. Eaten for lunch on Shabbat, cholent is made with meat, potatoes, onions, beans and barley, but variations and secret ingredients are common. Ohev Shalom recently tested the culinary strengths of its members with its second annual cholent cookoff. 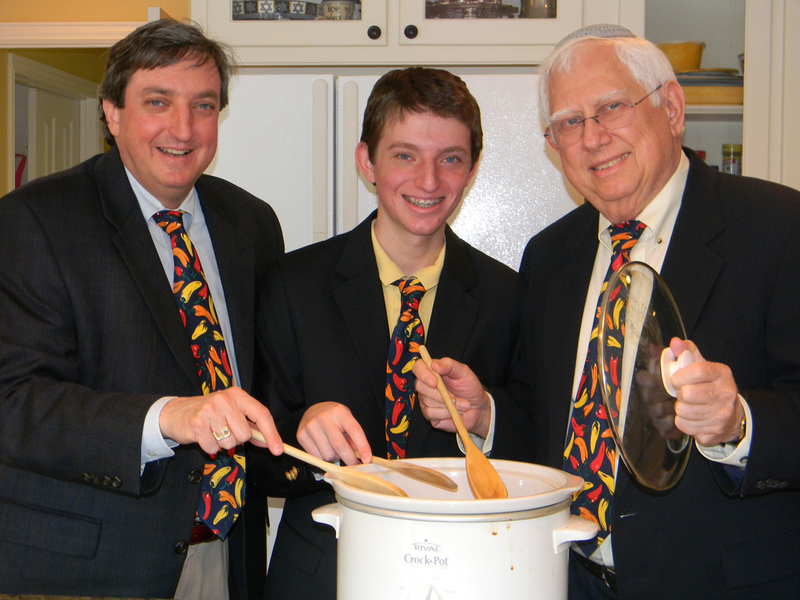 The final cook-off in the second annual Ohev Shalom Cholent Competition was a “hotly” contested battle among three groups of men, with the team of Lane Harris, Louis Calmenson and Ben Calmenson voted the best of the best. Other finalists included the teams of Aaron Yurowitz and Hillel Rodin, and Jeremy Cassius and Mark Esquenazi. 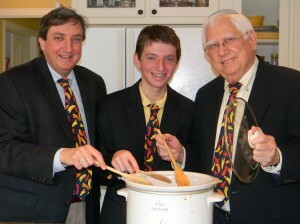 Ohev Shalom’s Cholent Competition began two years ago as a project of the Men’s Club. Each week during the year, a different team prepares cholent for the congregation to enjoy at the Kiddush following Shabbat morning services. Favorites are remembered and online voting determines the top three teams. Irv Munn has been named to the 2011 Executive Council of Raymond James Financial Services, Inc. in recognition of his outstanding client service and exemplary professional growth. Executive Council honors are presented only to those financial advisors who have demonstrated an extremely high level of commitment to clients through personal and professional integrity. This marks the fourth consecutive year that Irv has qualified for this recognition. In addition to Irv’s recognition, Raymond James Financial Services, Inc. recently earned praise from prominent industry media, such as Fortune magazine, SmartMoney and The Wall Street Journal. SmartMoney recently named Raymond James the best full-service broker in its 2011 Annual Broker Survey, for the third time in four years. The results were based on many factors, including client satsifaction and user-friendliness of account statements. Rabbi Israel Lashak and NCSY (National Conference for Synagogue Youth) invite you to attend its seventh annual “Evening of Laughs” featuring the comedy of acclaimed comedian Dan Naturman, at 7:30 p.m. on Sunday, Nov. 20 at the Improv Comedy Club 4980 Beltline Road in Dallas. Dan Naturman began performing stand-up comedy while a student at Fordham University School of Law. After graduating, he decided to turn his back on law and devote himself to comedy full time. His legal education did not go totally to waste however, as his New York State Bar Association membership gets him discounts on rental cars. Dan’s charming self-deprecating style has since made him a hit with comedy club audiences across the country. He was the favorite of celebrity judges Drew Carey and Brett Butler on Last Comic Standing 2 and has made several appearances on The Late Show with David Letterman and Late Night with Conan O’Brien. He can also be seen on his own Comedy Central Presents half-hour special. To purchase tickets or place an ad in a commemorative journa, call 972-934-9143 or e-mail ilashak@gmail.com. Ann & Nate Levine Academy will host First Grade Preview / Open House on Wednesday, Dec. 7th at 8 a.m. The program will be at the school, located at 18011 Hillcrest Road in Dallas. All parents and families with Kindergarten-aged children are invited to attend. The First Grade Open House will be geared toward those families looking to learn more about Levine Academy. The events will include campus tours and presentations, including opportunities to ask staff and faculty about the day-to-day experience of Levine Academy students. Levine Academy is an inclusive Conservative Day School for children 3 months through eighth grade. The school, associated with the Schechter Day School Network, strives to inspire a passion for learning and graduate confident, ethical, Jewish citizens and leaders. The school has been a leader in offering a broad education to the Dallas Jewish community since 1979. Levine Academy is accredited by the Southern Association of Colleges and Schools. For more information about Levine Academy or to RSVP to the First Grade Preview /Open Houses, contact Mireille Brisebois-Allen at 972-248-3032 or rsvp@levineacademy.org. The world’s greatest mother-in-law, Jane Ray (yes, she belongs to me) is perhaps the world’s biggest “Gone with the Wind” fan, having even travelled to Atlanta recently for the reading of some of Margaret Mitchell’s lost pages of the book. I’m sure she’d find the upcoming event this Saturday night at the Fairmont Hotel of particular interest. Storyopolis Entertainment and Ross Akard Gallery will host a “Pop Up Art Show” featuring works by renowned artist Yakovetic. At 8 p.m., the event will premier a new painting entitled Sons of the South, immortalizing “Gone With the Wind” actor and legend Patrick Curtis who will be on hand for the unveiling. Curtis played Melanie’s baby in the film in an uncredited role. The Yakovetic Fine Art Collection features Signature Series Limited Edition giclées signed by film cast members. Also showcased are original works inspired by The Wizard of Oz from Yakovetic Productions artists Phillip Graffham, Bridget McCarty, and T.J. Novy. Storyopolis Entertainment (SE) is an art collector’s paradise. SE is now home to the popular illustrated art from The Story Book House and the highly acclaimed contemporary art from The 4th Wall Gallery. This combined collection can be viewed and purchased at: www.storyopolisentertainment.com. SE owner Matt Abramowitz has over 15 years experience in the art and children’s book industry. He continues to take customers beyond the pages of children’s picture books by showcasing some of the world’s most distinctive authors and illustrators. Be sure to catch the future “Pop Up Art Shows” with partner Bryan Embry of the Ross Akard Galleries. Sorry, mom Ray, if it wasn’t for Jacob’s bar mitzvah this weekend, I’d love to take you down to the Fairmount Saturday night. Mazel tov on your bar mitzvah weekend, it’s going to be a fabulous, and I know you are well-prepared and ready to shine.